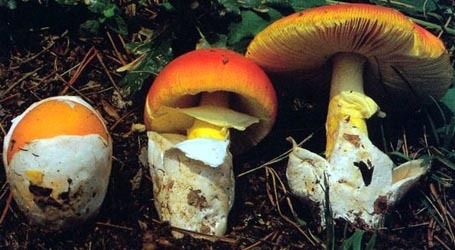 english name "Peck's Candlestick Amanita"
1. Amanita calyptratoides, Tapia Co. Pk., Los Angeles Co., California, U.S.A.
2. Amanita calyptratoides, Cleveland Nat. For., Riverside Co., California, U.S.A.
intro Amanita calyptratoides is unique amoung U.S. and Canadian amanitas because of its stipe that appears to be water soaked at least near the surface and the apparent, progressive dissolution of the ring. A similar species that is genetically distinct is known from the neovolvanic zone of central Mexico (see A. tlaxcandela). cap The cap of Amanita calyptratoides is 30 - 100 mm wide, pale brownish-gray to pale brown to brown; it lacks an umbo, usually has marginal striations with length 10% to 20% of the cap radius (in large specimens striations may appear only with aging), and often bears one or more white membranous patches of the volva and/or a white "bloom" or "frost" over the disk. gills The gills are free, close to subcrowded, white to pale cream in mass, and 4.5 - 8 mm broad; the short gills are more or less truncate, of varying length, unevenly distributed, and plentiful. stem The stem is 50 - 145 × 6 - 20 mm, the color and appearance of a tallow candle; it bears a small white annulus that appears to dissolve into the stipe as time passes. There is a white, membranous, sack-like volva (20 - 45 × 15 - 45 mm) at the base. spores The spores measure (8.5-) 9.8 - 14.0 (-17.0) × (5.5-) 6.5 - 8.9 (-11.8) µm and are ellipsoid to elongate (infrequently broadly ellipsoid) and inamyloid. Clamps are present at bases of basidia. discussion Amanita calyptratoides occurs with coastal live oak in (Quercus agrifolia) central and southern California, U.S.A. and in the Baja California peninsula, Mexico. The name is often misapplied. It has been mistakenly considered to be a synonym of A. calyptroderma G. F. Atk. 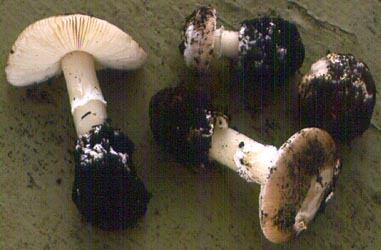 Amanita calyptratoides can be differentiated from A. calyptroderma by spore size and shape and by the former's unusual stipe and "dissolving" annulus. author Peck. 1909. Bull. Torrey Bot. Club 36: 329. ≡Venenarius calyptratoides (Peck) Murrill. 1912. Mycologia 4: 241.
lectotypifications Jenkins. 1978a. Ibid. : 26.
type studies Jenkins. 1978a. Mycotaxon 7: 26. Except where the work of another author is cited, the following is based on original research by R. E. Tulloss. pileus 30 - 100 mm wide, slightly sordid brownish white to pale grayish brown (much paler and both more creamy and more tan than 5B3) to pale brown (10YR 6/6) to (occasionally) rich saturated brown, unchanging when bruised, hemispheric at first, then convex and finally planoconvex, shiny-viscid when wet, becoming dull and subviscid then matte when dry; context watersoaked to white, 4.5 - 11 mm thick at stipe, thinning evenly to margin or thinning for 85% to 90% of radius, then membranous to margin; margin usually striate (0.1 - 0.2R), with striations lacking at first in largest young specimens, nonappendiculate, decurved; universal veil absent or as patch or patches or warts or with latter resting on large region (sometimes covering entire pileus) with white "bloom," white, unchanging when cut or bruised, detersile, membranous, at times relatively thick over disk. lamellae free or narrowly adnate with decurrent tooth, in either case with long and distinct decurrent line on stipe apex, close to subcrowded, off-white to pale cream in mass, white to slightly off-white to slightly watersoaked off-white in side view, 4.5 - 8 mm broad, subventricose (not rounded at pileus margin), thickest about at about 75% of radius from stipe; lamellulae truncate to truncate with tooth at pileus context to subtruncate to rounded truncate to subattenuate, unevenly distributed, of diverse lengths, plentiful. stipe 54 - 145 × 6 - 20 mm, slightly translucent, watery off-white to watery pale cream to off-white, with the appearance of a wax candle, unchanging when cut or bruised, subcylindric or narrowing upward or downward slightly or broadest near midpoint and tapering both upward and downward slightly, not or slightly flaring at apex, at first decorated above the partial veil with white pulverulence, this disappearing as though dissolving from apex downward, at times completely lacking the dry superficial fibrils usually seen in Amanita (these sometimes becoming apparent after handling); context often watersoaked in outer half to quarter of region beyond central cylinder, otherwise nearly white, unchanging when cut or bruised, hollow, with central cylinder lined with (sometimes also with crosswalls of) white and loosely interwoven fibrils that have more of an appearance of plastic foam than cotton, occasionally with crosswalls of firmer tissue, with central cylinder 4 - 8 mm wide; partial veil superior to subsuperior to nearly median, white, scant, very narrow, thin, membranous, tearing, becoming appressed to stipe rather quickly, relatively rapidly shrinking to narrow white line and then disappearing (appearing to dissolve as with apical pulverulence); universal veil as saccate volva, white, membranous to fleshy, rather tough, with limb less than 1 to 2.5 mm or more thick at point halfway between attachment of limbus internus and highest point of limb, with highest point of limb 20 - 45 mm above base of volva, 15 - 44 mm wide, soft, with exterior smooth and slightly fibrillose, with small to ledge-like limbus internus attached one-half to three-quarters of distance from highest point of limb to attachment of universal veil at stipe base, with region from limbus internus to stipe base appearing adnate to stipe in young material. odor/taste Odor absent to slightly rank, but then over-powered by odor of wet soil. Taste faintly bitter. tests Spot test for laccase (syringaldazine) - negative throughout basidiome. Spot test for tyrosinase (paracresol) - positive in most of pileus context, most of lower stipe context, and in spots on lamellae. Test vouchers: Tulloss 1-8-87-A, 2-15-98-C.
lamella trama bilateral; wcs = 50 - 65 µm; subhymenial base entirely composed of branching hyphae, with some hyphal segments partially inflated near pileus context; filamentous, undifferentiated hyphae ? µm wide, ? ; terminal, divergent inflated cells not observed; vascular hyphae ? µm wide, ? ; clamps present. subhymenium wst-near = (25-) 35 - 60 (-65) µm; wst-far = (45-) 60 - 90 (-95) µm; nearly entirely comprising uninflated to partially inflated elements in branched structure, with more inflation near pileus context; with basidia arising from ?? ; clamps present. basidia 63 - 86 × 10.2 - 13.2 µm, dominantly 4-sterigmate, occasionally 2-sterigmate; clamps present. 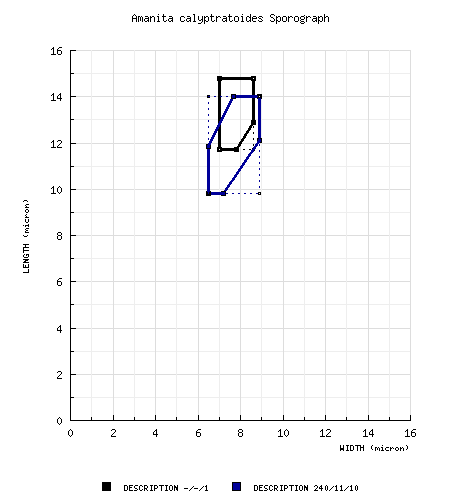 from type study of Jenkins (1978a): [-/-/1] 11.7 - 14.8 × (6.2-) 7.0 - 8.6 μm, (Q = 1.50 - 2.27; Q' = 1.66), hyaline, thin-walled inamyloid, ellipsoid to elongate to cylindric, often adaxially flattened; apiculus sublateral, cylindric; contents guttulate; color in deposit not recorded. [240/11/10] (8.5-) 9.8 - 14.0 (-17.0) × (5.5-) 6.5 - 8.9 (-11.8) μm, (L = (11.2-) 11.6 0 13.0 μm; L' = 12.0 μm; W = (7.3-) 7.6 - 8.0 μm; W' = 7.8 μm; Q = (1.26-) 1.36 - 1.82 (-1.99); Q = (1.40-) 1.44 - 1.70; Q' = 1.55), hyaline or somewhat clouded, colorless, smooth, with walls thin or up to about 0.5 µm thick, inamyloid, broadly ellipsoid to ellipsoid to elongate, often at least slightly adaxially flattened, sometimes not at all flattened adaxially adjacent to apiculus and then sometimes flattened on side opposite to apiculus, occasionally expanded at one end; apiculus sublateral, cylindric to narrowly truncate-conic; contents monoguttulate with or without additional small granules; white in deposit. ecology Solitary to subgregarious. In California: In dense, dark, somewhat sandy clay, in open Quercus agrifolia woods at the edge of chapparal vegetation or under Q. agrifolia. material examined from type study of Jenkins (1978a): U.S.A.: CALIFORNIA—Los Angeles Co. - Claremont, i.1909 C. F. Baker s.n. (lectotype, NYS). MÉXICO: BAJA CALIFORNIA DEL NORTE—??. U.S.A.: CALIFORNIA—Alameda Co. - Oakland, Dunsmuir Cyn., 29.i.2005 D. Rust s.n. [mushroomobserver.org # 31834] (RET 382-8). Los Angeles Co. - Malibu Crk. Pres., 29.iii.1981 G. Wright s.n. [F. Nishida 1016] (LAM 250874); Santa Monica Mtns., Cold Crk. Cyn. Preserve, Stunt Cyn., 27.xii.1992 Matthew Bell s.n. [F. H. Nishida 4919] (in herb. F. Nishida); Santa Monica Mtns., Malibu Cyn., Tapia Co. Pk., 14.i.1993 R. E. Tulloss 1-14-93-A (RET 081-2), -B (MEXU; RET 081-1); Walnut Crk., 7.ii.1981 Tim Paulitz s.n. (LAM 250779). Monterey Co. - Garland Ranch Reg. Pk., 15.ii.1998 D. Parker s.n. [Tulloss 2-15-98-B] (F; RET 273-7); Hastings Historical Preserve, 15.ii.1998 Igor Malcevski s.n. [Tulloss 2-15-98-C] (RET 0274-7). Riverside Co. - Cleveland Nat. For., El Ceriso, "Big Woods," 18.ii.1979 F. Nishida s.n. (LAM 250944), 8.i.1987 Greg Wright s.n. [Tulloss 1-8-87-A] (RET 116-1). Unkn. Co. - unkn. loc., winter.1998 David Arora s.n. [Tulloss winter.1988.DA2] (RET 244-7). WASHINGTON—Klickitat Co. - Lyle Cemetery, Balch Road [45.7204° N/ 121.3281° W, 175 m], 13.vi.2011 Dr. Michael Beug 21MWB110613 (RET 614-6, nrITS seq'd.). Material from Tlaxcala originally included on this page has a distinct nrITS sequence (among other genetic differences) and is now treated on this site as A. tlaxcandela. The question of morphological segregation is still an open one—more information is needed on the Mexican species. photo RET - (1) Tapia County Park, Los Angeles County, California, U.S.A.; (2) El Cariso, Cleveland National Forest, Riverside Co., California, U.S.A.
Debbie Viess - (3) Dunsmuir Canyon, Oakland, Alameda County, California, U.S.A.
select a collection to review/add spore measurements..#695201. David Arora, #s.n.=>Tulloss winter.1988.DA2, U.S.A., CALIFORNIA, Unkn. ..#700974. Chris Thayer, #s.n.=>Tulloss 11-21-89-MSSF, U.S.A., CALIFORNIA, Contra..#706484. David Arora, #s.n.=>Tulloss winter.1988.DA2, U.S.A., CALIFORNIA, Unkn. ..#740099. Dr. Michael Beug, #21MWB110613, U.S.A., WASHINGTON, Klickitat Co., Lyle..#783308. D. Rust, #s.n.=>mushroomobserver.org # 31834#783309. G. Wright, #s.n.=>F. Nishida 1016, U.S.A., CALIFORNIA, Los Angeles Co.,..#783310. Matthew Bell, #s.n.=>F. H. Nishida 4919, U.S.A., CALIFORNIA, Los Angele..#783311. R. E. Tulloss, #1-14-93-A, U.S.A., CALIFORNIA, Los Angeles Co., Santa M..#783312. R. E. Tulloss, #1-14-93-B, U.S.A., CALIFORNIA, Los Angeles Co., Santa M..#783313. Tim Paulitz, #s.n., U.S.A., CALIFORNIA, Los Angeles Co., Walnut Creek#783314. D. Parker, #s.n.=>Tulloss 2-15-98-B, U.S.A., CALIFORNIA, Monterey Co., ..#783315. Igor Malcevski, #s.n.=>Tulloss 2-15-98-C, U.S.A., CALIFORNIA, Monterey ..#783316. F. Nishida, #s.n., U.S.A., CALIFORNIA, Riverside Co., Cleveland Nationa..#783317. Greg Wright, #s.n.=>Tulloss 1-8-87-A, U.S.A., CALIFORNIA, Riverside Co...#783318. David Arora, #s.n.=>Tulloss winter.1988.DA2, U.S.A., CALIFORNIA, Unkn. ..#783319. Dr. Michael Beug, #21MWB110613, U.S.A., WASHINGTON, Klickitat Co., Lyle..#808388. C. F. Baker, #s.n., U.S.A., CALIFORNIA, Los Angeles Co., Claremont#808389. #? ?, MÉXICO, BAJA CALIFORNIA DEL NORTE, ??#808390. D. Rust, #s.n.=>mushroomobserver.org # 31834#808391. G. Wright, #s.n.=>F. Nishida 1016, U.S.A., CALIFORNIA, Los Angeles Co.,..#808392. Matthew Bell s.n. , #s.n.=>F. H. Nishida 4919, U.S.A., CALIFORNIA, Los..#808393. R. E. Tulloss, #1-14-93-A, U.S.A., CALIFORNIA, Los Angeles Co., Santa ..#808394. R. E. Tulloss, #1-14-93-B, U.S.A., CALIFORNIA, Los Angeles Co., Santa ..#808395. Tim Paulitz s.n. , #s.n., U.S.A., CALIFORNIA, Los Angeles Co., Walnut ..#808396. D. Parker, #s.n.=>Tulloss 2-15-98-B, U.S.A., CALIFORNIA, Monterey Co.,..#808397. Igor Malcevski, #s.n.=>Tulloss 2-15-98-C, U.S.A., CALIFORNIA, Monterey..#808398. F. Nishida, #s.n., U.S.A., CALIFORNIA, Riverside Co., Cleveland Nation..#808399. Greg Wright, #s.n.=>Tulloss 1-8-87-A, U.S.A., CALIFORNIA, Riverside Co..#808400. David Arora, #s.n.=>Tulloss winter.1988.DA2, U.S.A., CALIFORNIA, Unkn...#808401. Dr. Michael Beug 21MWB110613 , #s.n., U.S.A., WASHINGTON, Klickitat Co..